Important to note, once a facility is designed to utilize Tritium signs this usually means there is no electrical supply run to the Fire Code required emergency exit locations where signs are needed. This in turn means that once a facility utilizes Tritium signs, and they expire, it is cost prohibitive to replace the signs with anything other than a new Tritium exit signs. 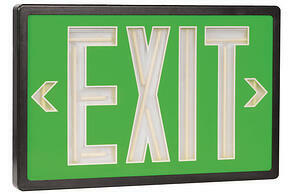 The labor and material required to “wire-up” new LED exit signs with battery back-up would be extremely costly. The challenge some facilities are facing at this moment is that there is a significant backlog (in some cases, six months) in order fulfillment from the only two companies manufacturing these Tritium signs. In fact, one firm was shut down for some time in the past year which has furthered the backlog. Unfortunately, facilities that have or had signs expiring in the past few months have been put in a difficult position. This is a very good reason to keep close track of your signs’ expiration date to plan months in advance for the replacement and proper disposal of the signs in accordance with EPA and OSHA regulations.